Providing safety is a priority that should never be overlooked. To avert danger in poorly lit areas requires powerful lighting solutions at a reasonable cost. 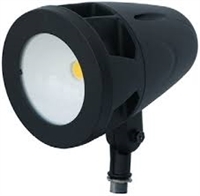 Cors Lighting offers security flood lights and assorted industrial flood lighting to meet the needs of safety in and around working environments. For a multitude of uses, indoor and outdoor flood lights provide an ample amount of bright, high-beaming light. We offer various styles and wattage depending on use and installation needs. Furthermore, our inventory includes items featuring LED lighting, plus items from the trusted Howard Lighting brand. Whether for parking lots, streetscapes, work sites, athletic fields and courts, retail or sign lighting and beyond, Cors Lighting is sure to have the most effective solutions for your flood lighting demands. Call us at 217-806-0502 for a quote or consultation today. We proudly offer bulk buying discounts, plus FREE shipping on orders over $99! The 7514 LED black flood light has a 5000K color temperature and voltage range of 100-240V. 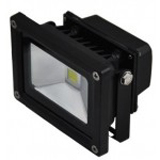 The equivalent to a 100W halogen, this NaturaLED flood light is rated to last 50,000 hours. This 13W LED flood light functions well as lighting for security, pathways, entryways and perimeters. With its easy installation and low maintenance, you can set up outside LED security flood lights in minutes and let them function as they should. Be sure to review the LED-FXFDL13/50K spec sheet for details on the light’s size, voltage and wattage, and shop with us to upgrade your perimeter lighting today! 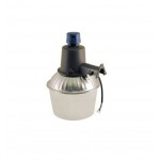 Howard Lighting BLED-B-4 - LED Flood, 44 Watts, 4000K CCT, 120-277V, w/ 1/2" NPT Swivel Arm 79938508667. • Dark bronze polyester powder-coat finish. • Tempered glass lens, thermal shock and impact resistant. NaturaLED's 29 Watt Architectural and Spot LED flood lights are an energy efficient replacement for 100W HID fixtures and offer a long LED life of 50,000 hours and low maintenance with excellent thermal management. The fixture features a wide-angle adjustable knuckle mount at 30°,60°, or 90°. DLC Qualified and eligible for utility rebates with a 5 year warranty. NaturaLED's 29 Watt Architectural and Spot LED flood lights are an energy efficient replacement for 100W HID fixtures and offer a long LED life of 50,000 hours and low maintenance with excellent thermal management. The fixture features a wide-angle adjustable knuckle mount at 30�,60�, or 90�. DLC Qualified and eligible for utility rebates with a 5 year warranty. This NaturaLED 28 watt LED dusk to dawn outdoor security light fixture is equivalent to a 100-150 watt Metal Halide/HPS/Mercury Vapor HID fixture. Ideal for outdoor security, pathway, driveway or parking lot lighting. 5 year warranty and easy installation. NaturaLED's 37 Watt Dusk to Dawn Security lights are an energy efficient replacement for 100W HID fixtures and offer a long LED life of 50,000 hours and low maintenance with excellent thermal management. The fixture is Dust to Dawn sensor compatible ideal for security lighting, pathway lighting, perimeter and entryway lighting. DLC Qualified and eligible for utility rebates with a 5 year warranty. 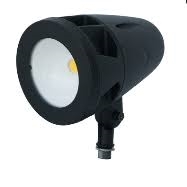 Howard Lighting BLED-D-4 - LED Flood, 75 Watts, 4000K CCT, 120-277V, w/ 1/2" NPT Swivel Arm 79938508668. Howard Lighting BLED-D-4-SF - LED Flood, 75 Watts, 4000K CCT, 120-277V, w/ 2" Slip Fitter 79938508669. NaturaLED's 58 Watt Architectural and Spot LED flood lights are an energy efficient replacement for 150W HID fixtures and offer a long LED life of 50,000 hours and low maintenance with excellent thermal management. The fixture features a wide-angle adjustable knuckle mount at 30�,60�, or 90�. DLC Qualified and eligible for utility rebates with a 5 year warranty. The NaturaLED's 58-Watt architectural and spot LED flood lights are an energy-efficient replacement for 150W HID fixtures, offering a long LED life of 50,000 hours. These energy-efficient flood lights are optimal for multiple applications, such as area lighting, spot luminaires, architectural lighting, general site illumination, retail spaces and signage lighting. 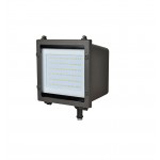 Due to excellent thermal management, this flood light is also a low-maintenance option to use for outdoor LED flood light fixtures in many climates year-round. It’s DLC-qualified and eligible for utility rebates with a five-year warranty. Please contact us with any questions or concerns, and our lighting experts will happily provide guidance and clarification. Cors Lighting is here to serve you and all your industrial and commercial lighting needs. Please call if you would like a u-mount instead of a slip fitter. Whether you are trying to illuminate the façade of your building, light up a small arena or brighten a parking lot, a metal halide floodlight is a wise investment in the aesthetic and safety of your property. This 400-watt flood light is one of the brightest and most powerful floodlights on the market, emitting a super bright beam that will help you feel secure no matter what conditions you might find yourself in. 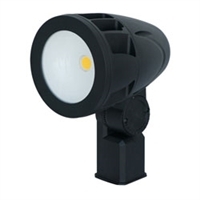 This 400-watt outdoor light is ideal for illuminating areas like car dealerships, horse riding arenas, parking lots and other commercial and industrial spaces. Included with this product are a U-bracket and light bulb, making it easy to mount onto the side of a building or onto a wooden pole by fastening with lag bolts. You can be sure that when you get items like this metal halide industrial lighting fixture from Cors Lighting, you are getting the very best that will deliver exactly what you need and require minimal maintenance. Place your order now! 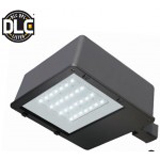 The LED flood light fixtures are DLC 4.0 Premium and IP65 rated with four installation methods sold separately: Swivel Bracket, Slip Fitter, 6” Extruded Arm and Yoke Mount. Compatible Integrated automomous and photocell motion sensors are available as options to address your needs. Dimensions: 13.38" x 8.66" x 2.56"
This 75 Watt LED shoebox area light fixture is DLC certified, IP65 Outdoor rated, and Title 24 compliant. It delivers 6,000 lumens, a 70 CRI, 4000K color temperature and has three different mounting options available; slip fitter, swivel bracket and 6" arm mount. Replace 150W metal halide fixtures with energy efficient LED technology and save on maintenance costs. The lamps on this LED light are rated to last 50,000 hours. 1000 Watt metal halide. Bulb included. Multi-tap for voltages of 120, 208, 240, or 277 volts. Comes with a 2" adjustable slipfitter which will slide over a round pipe of 2" to 2 3/8" outside diameter. Held in place by fastening the compression screws. This 110 Watt LED shoebox area light fixture is DLC certified, IP65 Outdoor rated, and Title 24 compliant with 0-10V dimming capabilities. It has a 8,800 lumen output, 70 CRI, 4000K color temperature and has three different mounting options available; slip fitter, swivel bracket and 6" arm mount. Replace 200W metal halide fixtures with energy efficient LED technology and save on maintenance costs. The lamps on this LED light are rated to last 50,000 hours. This 110 Watt LED shoebox area light fixture is DLC certified, IP65 Outdoor rated, and Title 24 compliant with 0-10V dimming capabilities. It has a 9,200 lumen output, 70 CRI, 5000K color temperature and has three different mounting options available; slip fitter, swivel bracket and 6" arm mount. Replace 200W metal halide fixtures with energy efficient LED technology and save on maintenance costs. The lamps on this LED light are rated to last 50,000 hours. 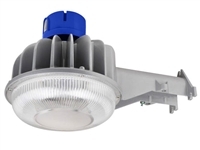 This 200 Watt LED light fixture is a direct replacement for a 1000 watt metal halide light fixture. The photo shows this light with a 6" mounting arm. We also have the option to substitute a 2" slip fitter, but we need to know this prior to purchasing or will need you to send a message immediately after purchasing.